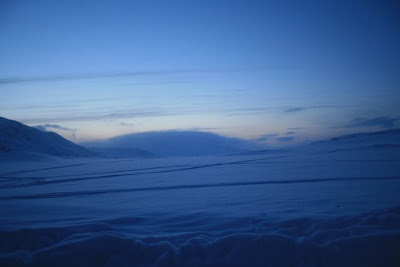 The Nordkalottleden in winter - Lappland in winter by skies! 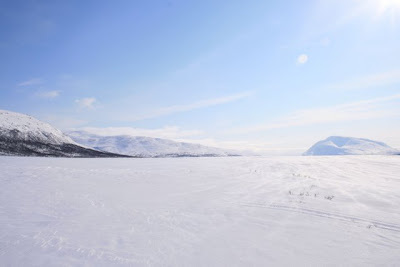 In the following you can read my short trip-report about Daniel’s and mine trip in Lapland along a section of the famous Nordkalottleden. I’m sorry it took me so long. I hope you enjoy my report and Daniel and I are both looking forward to read some comments from you. (The photos you can find either in the German report or as a diashow). Early in the morning, or lets say, in the middle of the night I jumped out of bed to get to the Vienna International Airport. My brother in law, Dominik, was so generous to fetch me to the airport. My flight to Stockholm Arlanda was at 7.10 am. I was so looking forward to come back to Scandinavia. Arriving in Stockholm, I took the bus to the city center, which took me about 40 minutes. In checked out the neighbourhood there and realized that Stockholm is apparently quite a nice place to stay. Having the opportunity for the last real lunch for a long while, I decided to eat one of my favourite dishes – yes, of course – pasta! The train to the final destination “Abisko Turiststaion” left at 5.10 pm. The weather in Stockholm was nice, with just few clouds and a slight breeze. After having a small chat to the other guy in the compartment (it was a sleeping car), I fell asleep quite fast. After having a reasonably good sleep I woke up at 6. 30 again, next day. And guess - it was snowing. Overnight we came from spring-like weather into deep winter. And I liked it! Daniel was supposed to join the train in Boden at about 7 am. Somehow we didn’t really know exactly how this will happen. Before departing in Stockholm I just asked the staff, if I need to change the trains on the way to Abikso or not, and they told me that this isn’t necessary. So I didn’t think much about and wasn’t worrying anymore but trusted Daniel that he will sure manage it to join the train – somewhere. Shortly after we were departing from Boden, I heard someone opening the wagon doors very load, followed with a scream of “Marko”. I knew, it was Daniel and jumped out of my compartment and we hugged us and we both were happy. I settled to the second class carriage, where we were talking about the last opened questions. 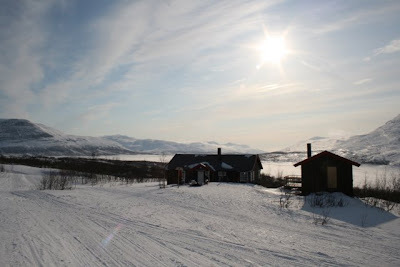 After a 19 hours train drive we finally arrived in Abisko. We were very surprised of the poor snow conditions there, as there were maybe just around 30 cm of snow. At the Visitors Center we tried to get some information about the conditions out there, but the guy at the desk wasn’t very informative. He just mentioned that the snow condition will change significantly after we arrive at the other end of the lake, we intended to cross. 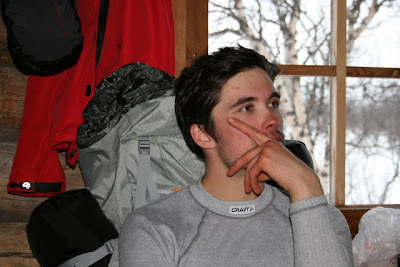 Telling him about our plan to walk to Kilpisjärvi, he seemed to be astonished. We dressed ourselves there, packed the backpacks amd made a last picture of us before leaving the civilization. The first problem of each trip appears at the very first steps. It is to find the start point. 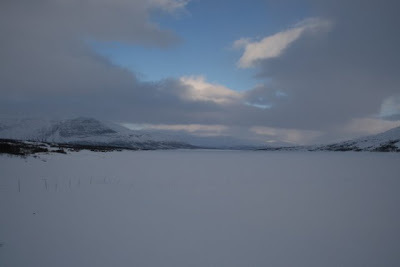 We knew, we had to come somehow to the huge lake - Torneträsk, which we planned to cross. The direct way to the lake was hindered by a river. So we followed a crosscountry track. After few minutes we knew that it wasn’t the right way. So we crossed the train tracks and came to the main road were we walked on for several kms. We hitchhiked a car which drove us for about 8 km. At that point we put our feet on the lake. I didn’t mention the heavy backpacks yet. I had a 65 L backpack which harboured all my stuff including my civil clothing and 10 kg of food. I estimate the weight of my backpack to about 33 kg. 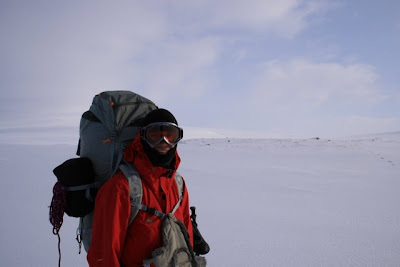 Daniel’s backpack was of course also very heavy, but he was lucky as he travelled already with his hiking clothes. The conditions on the lake weren’t inviting. 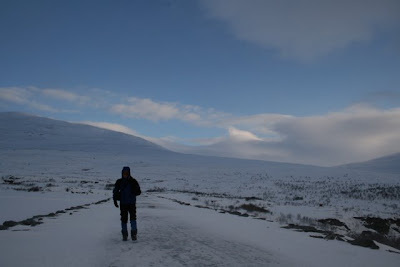 We had a strong wind over the right shoulder (from SE), it was very cloudy and we walked more or less on ice. We couldn’t bear with a compass as there were no point to bear. So we were totally dependent on Daniel’s GPS. 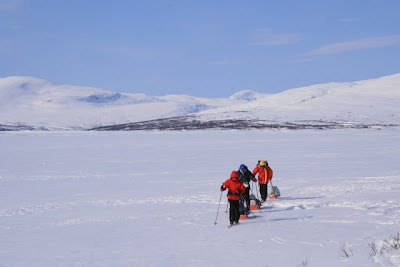 As we arrived at the other end of the lake, there were just 2 km left, with 250 m gain in altitude to come to our first hut “Lappjordhytta”. These final 2 km were leading through birch forrest with countless small but steep hills. These hills were too steep for our skis so we had to walk them up without skis. 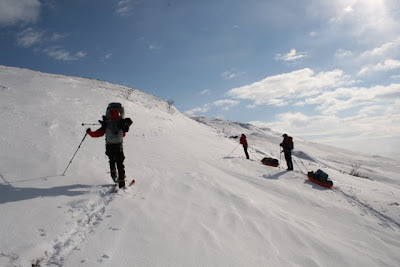 It was a pain, because at almost every step we were knee-deep in snow. 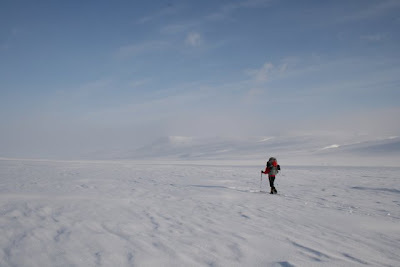 We required 2.5 hours for these last 2 km and without GPS we would have never found the hut, as it was perfectly hidden in the forrest and in the clouds. Arriving at the hut the first thing to do was to make a fire, melt snow and of course, dinner… Later in the evening a group of five finish skiers arrived at the hut. 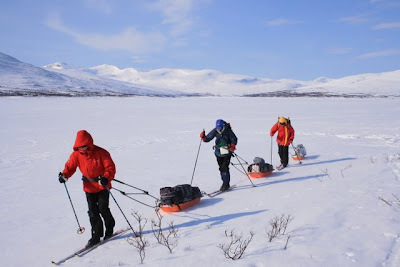 They started their journey in Kilpisjärvi, our aim. They seemed to be very experienced and told us that they hardly found the hut, with GPS of course. 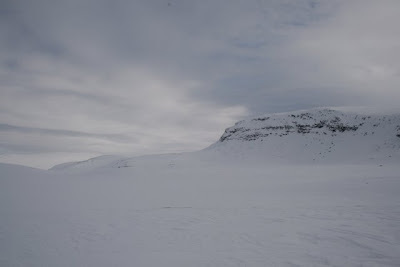 They told us that they had terrible storm up on the high plateau, which Daniel and I intended to cross next day. The weather in the morning was very bad. Over night about 30 cm of snow were falling. 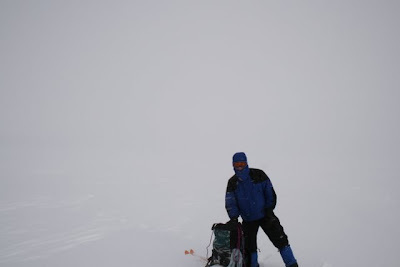 We had very bad visibility. The norm-pressure was 1003 hPa, indicating the bad weather. 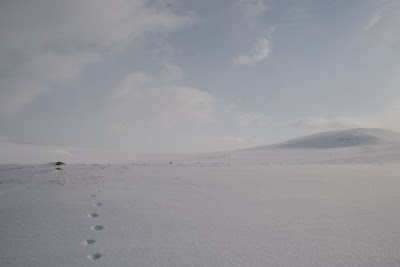 Besides all facts indicating not to leave the hut we decided to try to walk to the next hut, 27 km far away. The Fins were surprised about our decision, as they knew that the 500 m in altitude are quite hard anyway. But, on the other hand we didn’t want to rest already on our 2nd day. We thought, this might bring us in real time pressure! We fixed a point 9 km far away, which we wanted to reach in 4 hours, at about 1 pm. 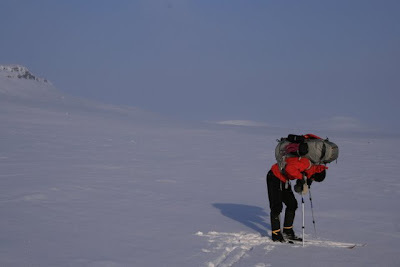 If we wouldn’t be able to do so, we would have to turn, because otherwise we would run out of time and wouldn’t reach the next hut before night. After few meters of walk up the slope we happily recognized that the rope-modified skis enormously improved the performance of the skis. We actually also recognized that the temperature was decreasing with each meter gain in altitude. Additionally also the wind increased with altitude. But we couldn’t improve as fast as we expected and as we wished to do. 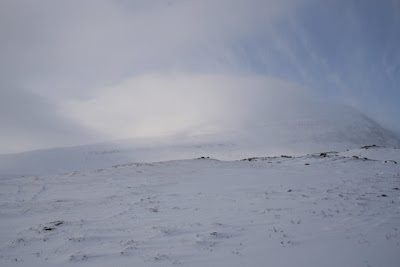 The deep snow, strong wind and zero visibility made it very hard to walk up the slope. We estimate that the wind up at 900 m reached about 30 m/s, so strong that we had to lean against it. Of course the wind was blowing exactly against us. Absolutely exhausted we reached the fixed point at 3 pm, 2 hours later than desired. We walked just at a speed of 1.5 km/h. So we had to choose a difficult but right decision – we turned and walked back. It was simply just not possible to walk the remaining 18 km in the next 6 hours; even 10 hours wouldn’t be enough. Frustrated and very tired and broken we arrived at the hut where we started the day at 6 pm. 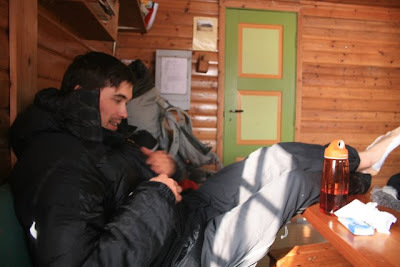 There were 2 parties in the hut, asking about the conditions up there, where we have been. The “Norwegian” party told us that they wanted to walk last day to this hut, but turned back on the lake due to bad conditions. We knew, if they did so yesterday, they would never even tried what we have done today. Already thinking of quitting the trip, our motivation was on all time zero. We didn’t know what to do, going to Oulu and making some trips in Finish national parks was one option - an option without passion. With just doubts we fell asleep this night! In the morning the weather seemed to become better. Daniel and me agreed to try it once again. Besides this, Daniel held contact to the Norwegian fellows. They were waiting to get a call to get information about upcoming weather conditions. As they got it, they said that the wind would be strong, but calm down during the next days. 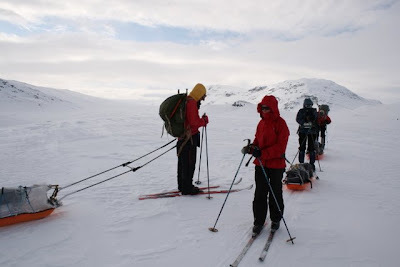 They decided to walk to the next hut and Daniel and I joined them and were very happy of doing so, as we would have more breaks in between making the tracks in the snow, which changed significantly over night due to strong wind. It was just partially cloudy, but the wind was still very strong. Nevertheless we were much faster than the last day. 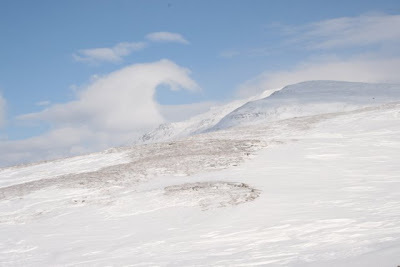 Of course better visible conditions contributed to this, as did the wind-compacted snow. For the firs 9 km we required just 4 hours, 2 hours faster than the day before. And of course the fact that we were five people made it much easier for making the track. After 10 hard hours we arrived at the hut, where a school class apparently had a kind of outdoor-lesson. 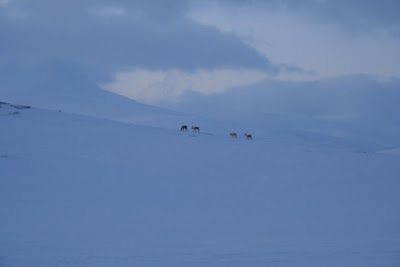 They had some dinner left, reindeer meet, which was eaten then by us. 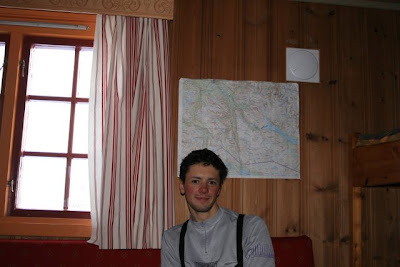 Quite tired, but very happy I fell asleep on the ground of the hut, in mind that the next day wont be demanding at all. We got up very early, to avoid trouble with the kids which were also sleeping in the hut. Thus we left the hut already at 8 am. 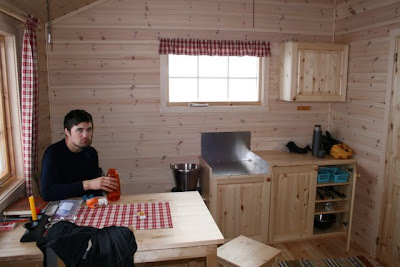 The next hut, Gaskashytta, was just 13 km away, across the the lake, so easy terrain. It was again just partially cloudy, but of course we had again strong wind blowing against us. Nevertheless we reached the hut already at 12 pm. We had tomato soup for lunch. As I was still very tired from the previous day, I took an afternoon nap to recover from the hard kilometres we have already done. 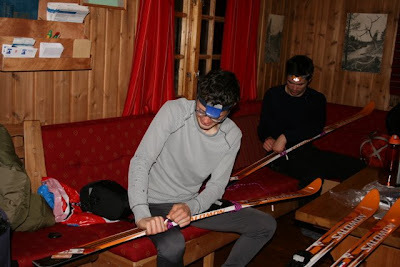 In the evening Daniel and I prepared the skis again, as there will be a steep slope waiting right ahead of us to be walked up right next morning. 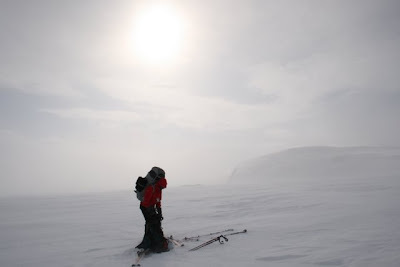 We started again quite early, as the day was expected to become very hard and long. Right in the morning we had to gain 400 meters in altitude to reach a high-plateau. The first few meters were leading through a birch forest, but shortly after we passed it we were in the middle of being challenged by this long slope, of modest steepness. We had again wind blowing against us, it couldn’t be the way around. We estimated the wind strength at about 20 m/s. This slope seemed to be endless. Almost on the top three hikers passed us. 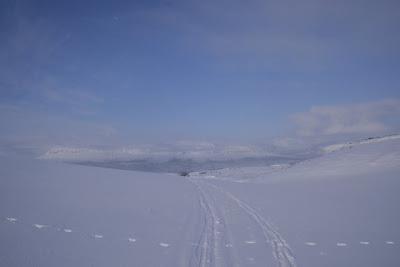 They were coming from the other direction (from Kilpisjärvi). They were German and besides Daniel and me the only guys hiking with backpacks. Latest at this point it was clear to me, why no one is walking in the same direction as we were – because of the wind. We had no indications that someone was walking in our direction (followed due to book entries in huts), but we met three parties going in the other direction. 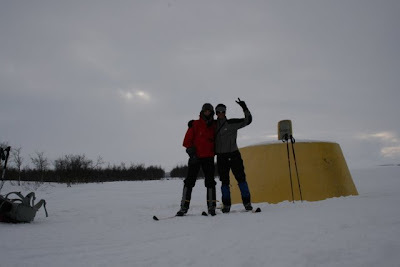 Arriving on the top, Daniel and I “unroped” our skis, as it was going slightly downwards. 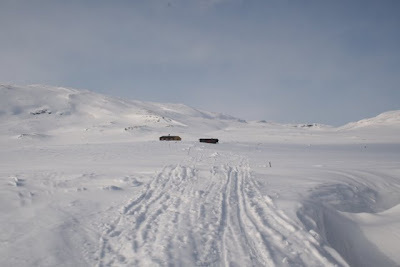 We have seen the hut already about 4 km ahead of us. Somehow the feeling was good to know that it can’t last long anymore to reach it, on the other hand it seemed like the hut isn’t coming closer. 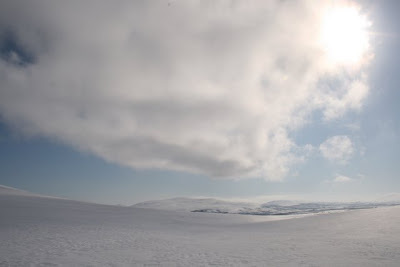 After we reached the hut, Daniel and I were starting to think about to continue to Kilpisjärvi, and not to exit the hike in Dividal, from where we would go to Tromso. It would take ages until we would come to Oulu from there. On the other hand we regained our strength and motivation and we put so much effort into it so we didn’t want to quit at all, but instead just had to try to continue. So we decided quite fast to take the opportunity and continue, since otherwise this trip would hardly count anything. 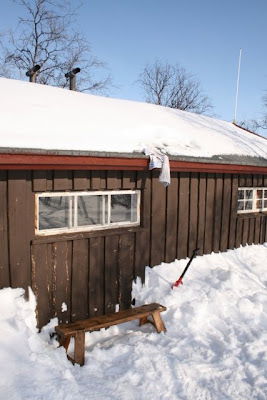 Our aim for this day was Havgahytta, a Swedish hut with just two beds. As we didn’t want other people to occupy them, we started, as mentioned, very early, to arrive there at noon or shortly later. The “Norwegian crew” wished us much luch and told us to take care of ourselves as the light conditions were bad this day. It was very cloudy, and I don’t need to repeat myself, but I do, wind was blowing against us. After we crossed the lake, it went downhill and the weather changed. Almost no wind and for the first time we had really nice weather. Going downhill through birch forest was big fun. 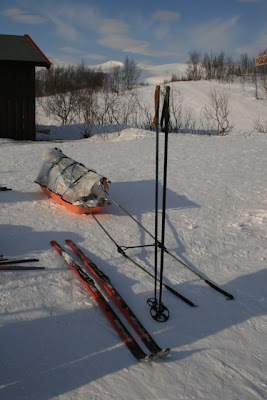 The last 100 m in altitude were through moderate steep birch forest, wherefore we could literally ski down. If you have ever seen a James Bond movie, you have alredy seen how it looked like. Great fun! We reached the hut and a girl, with a dog, was just about to leave. We were sitting in front of the hut, as the sun was so enjoyable. Later we took an afternoon nap. For dinner we had once again 250g of pasta, each. But, surprisingly, we were still hungry. So we fell asleep with a stomach still offering much place for food. We started the day already at 7 am, as the longest day-trip was ahead of us – 45 km should be covered this day. Somehow we both felt really strong this day, and overall, it was a beautiful day, with amazing landscape! 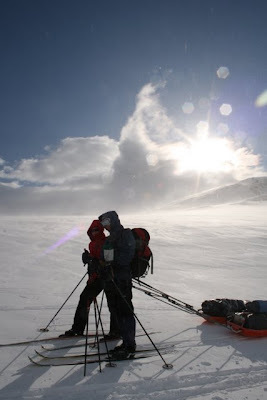 For the first time we had wind favouring our movement, which made it much, much easier for us! 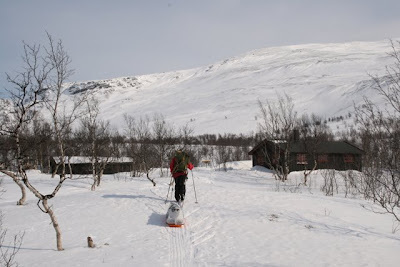 We made a break at Daertahytta, had some tea and Powerbars, and continued with 12 km remaining to the Storrosta-hut. The sun was about to be hidden in the back of the mountain ridge, and as we made a 90° turn to the north we entered the shadow of this mentioned mountain ridge. We have seen the hut already in front of us, about 2 km far away. 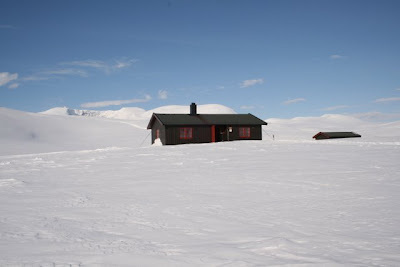 When we finally reached it we were surprised about the hut – it was brand new. Nevertheless this also had some disadvantages, as it was very difficult to make fire in the oven. But after a fire alarm and a smoked hut, the wood in the oven was finally burning! For dinner we had two packages of expedition food. This means, we have taken in about 1500 kcal. I was full, but Daniel was still hungry. With a full stomach I fell asleep in my comfy sleeping bag, but wake up in the middle of the night as two other guys entered the hut. It was a bit scary, as you don’t expect someone coming to a particular hut right in the middle of the night. They recognized that we were already occupying the hut and moved to the neighbouring hut. This attitude was very niche from them, so they didn’t disturb our really required sleep. The coldest morning - -20°C. Another long and demanding day was ahead of us, so we again started very early, this time at 7.30 am. For breakfast we had, as always, muesli. For me it became from day to day harder and harder to eat enough muesli. 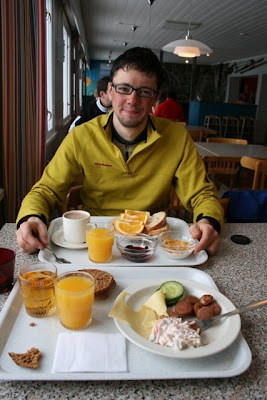 We had about 200g – 250g muesli per breakfast. I knew I have to eat as much as I can, although I had to stuff the last half of breakfast somehow in my body making it not enjoyable. The weather became worse again. Sky was covered with clouds. But luckily the wind stayed calm. It was very hard to bear, so we walk in a kind of zigzag lines and made some additional km, as we wouldn’t have enough to walk! Snow wasn’t nice to walk on, so it once again made the story quite hard and painful. 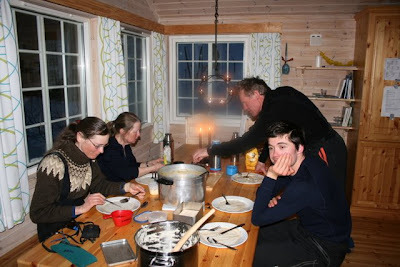 We had our break in the last Swedish hut before arriving in Finland. We had Powerbars and chocolate for lunch to get supplied with energy as there was the last mountain ridge waiting to be walked over. Luckily from this hut the way was marked and a snow-scooter track contributed additionally to easier walking. We didn’t need to pay attention to navigating, but could put all our energy. After arriving on top, we have seen for the first time the valley we wanted to go to. Besides the bad weather this view was still amazing. 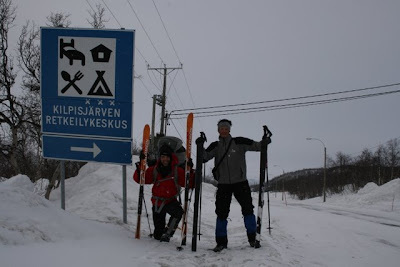 We skied down the last 4 km to the valley and arrived at the point where Norway, Sweden and Finland border on each other. From there on there were just 200 m left to the hut, where we spent our last night. A young finish girl arrived later. She was an elf from Santa Claus. Of course I had to ask her quite many questions about working for Santa Claus. I’m sure she felt like being in a cross-examination. Our alarm rang at 5 am. It was already bright, of course, since the sun rises at 5 am. For the first time I didn’t have muesli for breakfast, and as I discovered later, I was feeling that energy in the muscles was simply missing. We left at 6 am to ensure, we wont miss the bus, which was going to leave at 11 am. We had just a distance of 12 km to walk, so we should have absolutely no trouble with time. 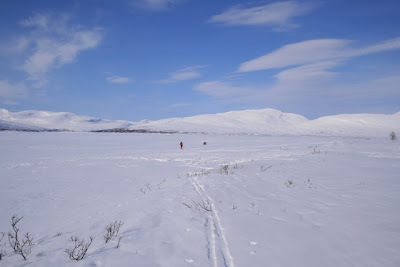 After 1 km we put for the first time our feet on lake Kilpis – Kilpisjärvi. So, the last 11 km were leading on the lake. Somehow, as already mentioned, my body didn’t want to walk fast. On the other hand Daniel was in the lead and made tremendous speed. As I knew that our journey was shortly to be over I put all my energy to follow Daniel. The distance seemed to be endless. After making a slight turn to the left, around a peninsula, we have already seen the coast. The pulla in front of our eyes pulled us somehow to the coast, as it was our dream to eat them. Finally arriving at the very end of the marked path, we just had to find a way up to the main road. 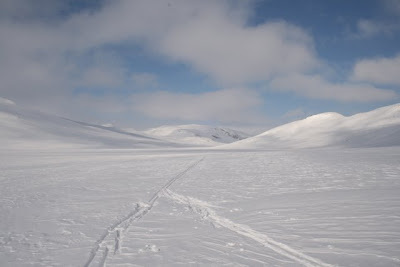 We did so and there we were at “Kilpisjärven Retkeilykeskus”. It was an amazing feeling, although quite tired, to be there. We both enjoyed to be finally back in civilization. In this restaurant we had a huge breakfast buffet. Of course I had finish makara for breakfast. 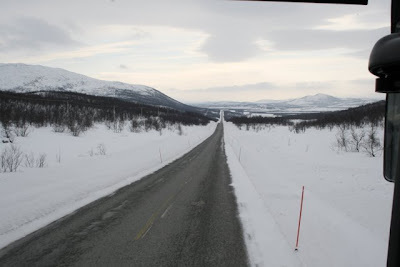 We left Kilpisjärvi at 11 am with the bus to Rovaniemi, from where we took a train to Oulu. After 10 hours of journey we arrived in Oulu. Winter was coming back and it was snowing when we arrived. We both were very happy that we successfully completed our tour and looked forward to spend some nice, relaxing days in Oulu. The trip was far more demanding than previously expected. Unfortunately I didn’t have much time to prepare myself for this trip, mentally and physically. Therefore I want to thank Daniel for his effort to plan this trip so well!!! 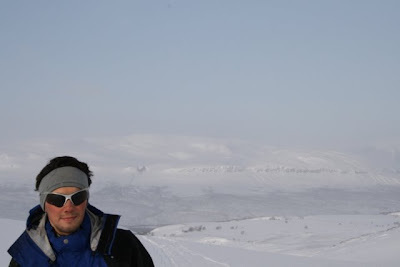 So, for the ones who read this and might intend to go hiking in Lapland as well, I have still some advice. 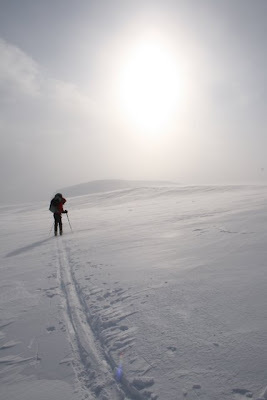 If you consider taking a longer hike during wintertime in Lapland I highly recommend taking a pulka, as it will enlighten your trip significantly. Hiking for 10 days with this giganormously heavy backpack was no fun at all. Your back will be very thankful of doing so (my vertebra is still hurting). It might be a bit trickier to walk up slopes, but skiing downhill with a pulka is also much easier than with a backpack as it provides you with additional stability. To maintain balance is much more difficult with a heavy backpack on your shoulders. Once again I was quite desperate of the wind. Not just the strength, but the continuity it blows is what might be very depressing. 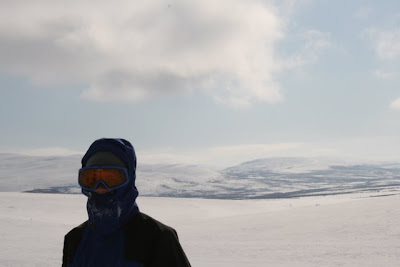 I wore almost the entire time a balaclava to protect myself from strong wind – especially the lungs. Going there, you should be aware that you might have wind the whole day blowing. So, don’t be surprised, if it happens! We underestimated the impact of weather conditions to come forth. In case of a snowstorm don’t try to walk farther, as it is just too demanding and too dangerous. 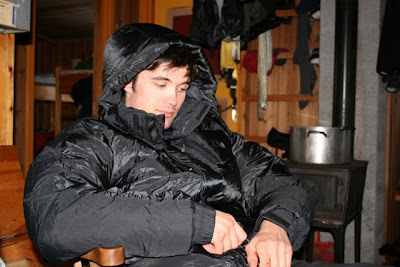 If weather conditions don’t permit it, don’t hesitate to wait and rest one day. Eat as much as you can for breakfast and dinner, as they are usually the only real meals you eat. 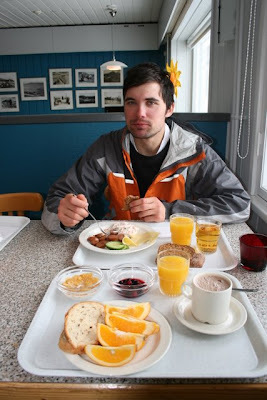 For me it was very hard to eat a huge breakfast and I literally had to stuff it into my body, but it was of great importance to do so, as this is the energy supply for almost the whole day (besides eating some bars during walking). And for dinner, take yourself time. I have to say that I liked the expedition food very much. It has just advantages. So, in my next trips I will for sure omit pasta but instead take the expedition food in pouches. Don’t forget to drink much and to take in increased amounts of vitamins. In bad weather conditions a GPS very helpful and maybe it is also vitally important. 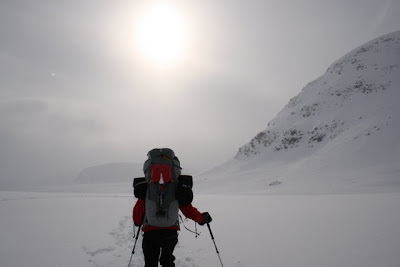 Many stories have been told already about GPS saving lives of hikers in bad weather conditions. Although I am not a fan of highly sophisticated technology in the wilderness, it is nonetheless good to know that in case of emergency you still have a system, which can provide you “safety”. Don’t be so naïve of following snowmobile tracks. You might think they go into the right direction. Don’t trust your gut feeling, but rather check on map the real orientation and in case of slight deviation leave them. It will safe you time and energy. 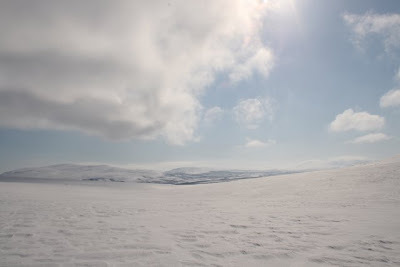 The one very comfortable thing going hiking in Lapland in April is the daylight. But, on the other hand the nights are short, so one could easily have problems of getting enough sleep. So, there might be still some things not being mentioned. But, as I learned, sometimes you have to make mistakes by yourself to learn. But, on the other hand, you can trust me, sometimes it’s also better to take someone’s advice. Hope, you enjoyed our posts and pictures we have made. Thanx for being interested in our trip! Wish you fellows all the best. 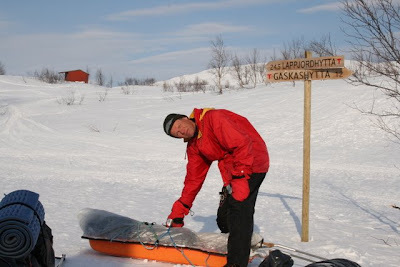 Dieser Artikel enthält den deutschsprachigen Tourenbericht unserer Nordkalottledentour im Winter 2008. Der Bericht gibt die GPS-Daten/Koordinaten der wichtigsten Punkte der Tour auf dem Nordkalottleden wieder. Alle Daten und Beschreibungen sind subjektiv und ohne jegliche Garantie auf die inhaltliche Richtigkeit zu verstehen. Erklärungen zu Bildern sind immer unter dem Bild zu finden. 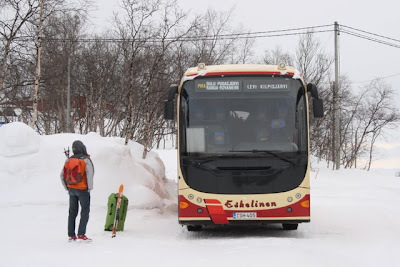 Gestern abend sind wir mit dem Bus und dem Zug nach 10-stündiger Fahrt aus Kilpisjärvi nach Oulu zurückgekehrt - sehr glücklich und zugleich auch ziemlich erschöpft. Was liegt nun hinter uns? Was haben wir dabei? 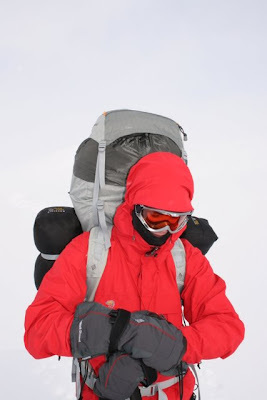 Warme Kleidung, Schalfsäcke, Isomatte, Schneeschaufel Vaude, Essen für 9 Tage (5kg Pasta, 8 Pastasaucen, jeder 22 Powerbars, jeder 2,8 kg Müsli und Milch-Eiweiß-Pulver, etwas Vollkornbrot, pro Tag 300 Gramm Schokolade, insgesamt 600 Gramm Studentenfutter und noch ein paar andere Kleinigkeiten. Außerdem einen Omnifuel Benzinkocher mit einem Liter Reinbenzin, einen Biwaksack für 2 Personen und ein E-Trex H von Garmin, ein kleines GPS-Gerät sowie 15 Meter 5,5 mm Dyneema Reepschnur. Wir ahnen noch nicht welche Bedeutung das GPS und das Seil für unseren weiteren Tourenverlauf haben werden, aber ohne diese beiden Ausrüstungsgegenstände wären wir wohl nie am Ziel angekommen. Rucksack packen in der Abisko Turiststation... Marko hat alle seine Sachen wegen des Fluges und der langen Reise in einem Seesack mitgebracht. 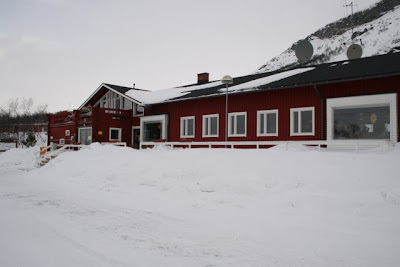 Um 11:51 erreicht unser Zug Abisko Turiststation, einen kleinen Bahnhof oberhalb des vom STF (Schwedischer Alpenverein) betriebenen Hotels westlich vom Ort Abisko. Wir gehen erstmal ins Hotel und Marko packt seinen Rucksack. Er hat noch einen Satz normale Klamotten, den Seesack und einen kleinen Rucksack dabei - viel zu viel für unsere Tour. Sein Rucksack wiegt nun bestimmt 30 kg, meiner ist aber mit guten 25 kg auch kein Vergnügen. Jedes Aufziehen ist mühsam und schwierig. Man wankt mehr als dass man gehen kann, zumindest bis man sich an das Gewicht gewöhnt hat. 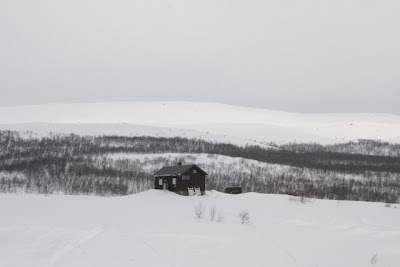 Über den Torneträsk laufen wir bei starkem Seitenwind zur ersten Hütte, der Lappjordhytta. Der Torneträsk ist einer der größten Seen hier in der Gegend und zieht sich über ca. 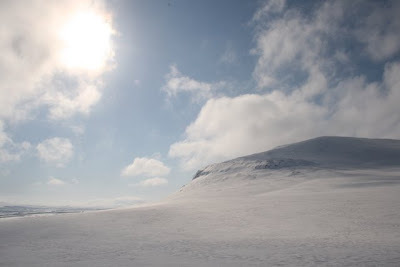 50 km zwischen Schweden und Norwegen durch das wirklich riesige Hoctal von Abisko. Die Lappjordhütte liegt am oberen Rand einer von kleinen Bergen durchzogenen Birkenwaldzone und ist vom See nur mühsam zu erreichen. Es geht steil bergauf und mangels Fellen an den Skiern - wir haben nämlich keine mitgenommen, kommen wir an die Grenze unserer Kraft. Zweieinhalb Stunden für 250 HM und 2 Kilometer ist einfach viel... Wir kommen ins Fluchen und meine Erkältung von vor der Tour verbessert sich dank der Anstrengung auch nicht gerade. Zuletzt wird das Gelände so unübersichtlich und hügelig, dass wir die Hütte erst sehen, als wir 200 Meter davon entfernt sind - unglaublich. Erst ging es an einem Rentierzaun bergauf, seitdem wir diesem aber verlassen haben und Richtung Norden aufsteigen müssen wir das GPS nutzen um den Weg zu finden. Vom See auf 340 Meter steigen wir auf bis zur Hütte auf 540 Meter Höhe, ohne GPS wären wir nicht einmal bis hier gekommen. Auf der Lappjordhytta des DNT ist noch niemand anderes. Mit dem vom DNT Norwegen besorgten Hüttenschlüssel sperren wir das Einheitsvorhängeschloss an der Tür auf und gelangen in die gemütliche Hütte - wirklich eine tolle Hütte, es gibt Geschirr, einen Gaskocher, ausreichend Holz, einen schönen Ofen, Matratzen und Betten, etc. Uns gefällt es sehr gut. Aber unsere Motivation ist zunächst an einem Tiefpunkt. 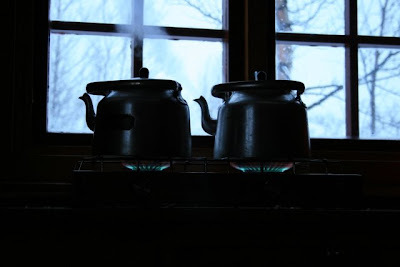 Nach der Ankunft schmelzen wir Schnee und kochen Tee. 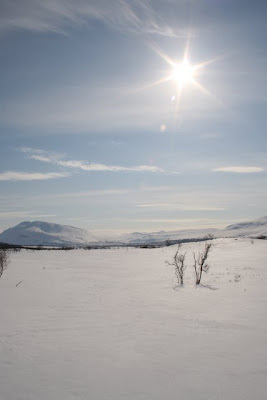 Dann beschließen wir erst einmal zu Essen, bevor wir weitere Entscheidungen fällen - denken wir doch schon daran abzubrechen und nach Kilpisjärvi zu fahren. Aber wir wollen es wenigstens nocheinmal probieren morgen. Die 500g Pasta schmecken uns gut und es wird das einzige Mal auf der Tour sein, dass wir sie nicht ganz aufessen. 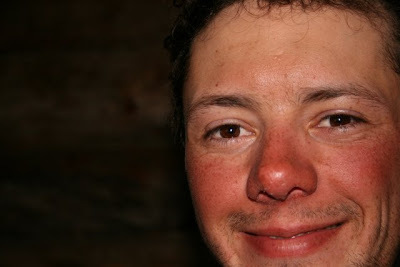 Draussen weht ein starker Wind, er pfeift um die Kanten der Hütte und lässt die Birken draussen wackeln. Die Sicht ist dank Schneefall und starker Bewölkung ebenfalls sehr gering, wir können eigentlich gar nicht genau sagen, wie die Hütte liegt, wo Berge sind und wo nicht, wo das Tal ist etc. Übrigens bin ich sehr zufrieden mit der Daunenjacke von The Northface, die ich mir vor dem Abmarsch noch besorgt habe (in Ingolstadt). Sie hält einen nach der Ankunft in der noch nicht geheizten Hütte unkompliziert und schnell warm. Sehr gemütlich und das Gewicht auf jedenfall wert! Eine Daunenjacke (ab 600 Cuin Fillpower) ist Pflichtgepäck würde ich hiermit sagen. Später am Abend, als wir gerade unsere Pasta anfangen wollen, trifft noch ein finnische Gruppe aus der entgegengesetzten Richtung ein. Sie haben die Hütte ebenfalls nur mit GPS auffinden können und sind entsetzt vom Wetter. Wir erzählen ihnen wie mühsam der Aufstieg war und bekommen im Laufe des Gesprächs einen wertvollen Tipp: der Älteste der finnischen Gruppe rät uns dazu, Seil um die Skier zu knoten, das würde genauso wie ein Fell wirken. Die Idee sagt mir zu, besonders, da wir am nächsten Tag 500 HM aufsteigen müssen. Gesagt getan, es tut ins der Seele weh, die teure Dyneemaschnur zerschneiden zu müssen, aber sie rettet uns die Tour, denn ohne Felle hätten wir umdrehen können. 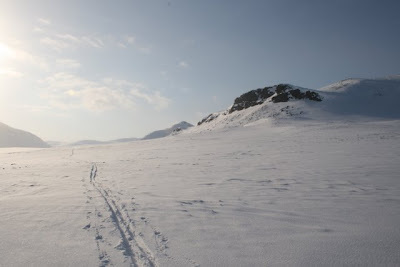 Nach einiger Zeit haben wir alle 4 Ski mit der Schnur so umwickelt, dass vor und hinter der Bindung unter dem Ski Knoten sitzen, die uns Rückhalt auf der Schneeoberfläche geben werden. Damit das ganze auch hält, haben wir die Umwicklung vor und hinter der Bindung miteinander verbunden, so kann das Ganze nicht vom Ski hinunterrutschen. Außerdem bekommen wir zu hören, dass Pulkas auf jeden Fall das bessere Mittel der Wahl sind, ein Rucksack ist viel zu anstrengend. Pulkas sind Wannen, die man an einem speziellen Gestell hinter sich herzieht - eine feine sache, jetzt ist es aber zu spät dafür - dir Rucksäcke, das ist uns bereits klar, sind viel zu schwer, aber was solls... Recht früh gehen wir ins Bett und schlafen gut. Marko verordnet mir vor dem Einschlafen und zukünftig dreimal täglich 25 Tropfen Codein gegen meine Erkältung - das Zeug hilft wirklich wie die Pest - WOW! Bei ganz schlechter Sicht und in unübersichtlichem Gelände steigen wir heute Richtung Altevatn auf. Wir halten uns zunächst zuweit östlich, da wir das Gelände nur schlecht überblicken können. Über steilere Aufschwünge steigen wir dem Pass im Lairevaggi entgegen. Unterwegs haben wir zwei Wegpunkte im GPS, es hätten mehr sein können. Das Gehen ist mühsam, einmal, weil es so steil bergauf geht und andererseits, weil es wirklich richtig starken Wind hat, der einen teilweise nahezu umwirft. Oben angekommen nach knapp 500 Höhnmetern haben wir zudem noch bis zu 20 cm Neuschnee, unser Vorankommen wird durch diese Bedingungen sehr erschwert. Nach 6 Stunden haben wir ungefähr 6-8 Kilometer zurückgelegt und es ist bereits halb drei. Wir werden Altevatn heute nicht mehr im Hellen erreichen, so stellen wir fest, und beschließen daher den Rückzug anzutreten. Das Gelände ist zu gefährlich, um im Dunklen abzufahren. Wir nehmen die Schnüre von unseren Skiern ab, als wir den Pass erreicht haben, denn dann kommen wir schneller voran. White-Out, gerade mal macht das Wetter ein wenig auf und wir machen diese Photos. Vorher haben wir noch viel weniger gesehen, eigentlich gar nichts. Kurz vor der flachen Passhöhe (UTM 34 W 0409770 7606550) drehen wir um. Das Bild zeigt den Berg am Eingang zum Pass, wir sind schon wieder auf dem Rückweg, äusserst ausgepowert und angestrengt, auch leicht frustiert, diese Tour scheint wie verhext zu sein. 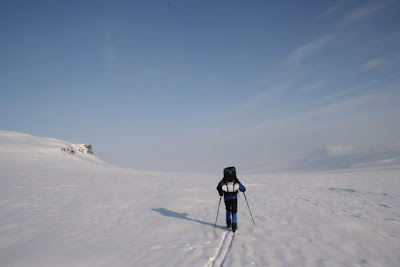 In unserer Spur laufen wir erst flach durch den Talbeginn unterhalb des Sattels zurück Richtung Lappjordhytta. 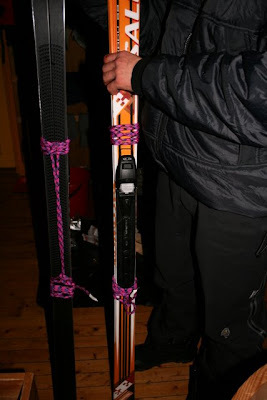 Dann geht es in einer längeren Abfahrt teils recht steil und durch die wackligen Ski in Kombination mit dem Riesenrucksack mühsam bergab. Einmal stürzen wir fast in eine riesige Senke, die von einer großen Wächte verdeckt wird. Im letzten Moment kommt mir das Ganze komisch vor und ich umgehe die im Nebel nur schwach sichtbare Kante - auf seine Intuition sollte man in diesem Gelände wirklich stets und ganz genau hören. 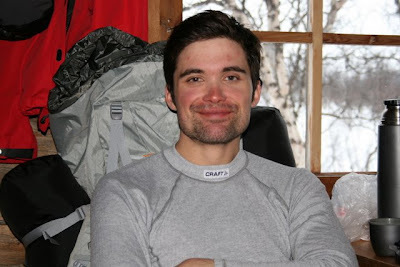 Beim Abfahren fahren wir eine ganz andere Route als im Aufstieg, aber dank GPS und Markos scharfen Augen landen wir recht gut bei der Lappjordhytta. 9 Stunden für 9-12 Kilometer haben wir gebraucht, unfassbar. Auf der Hütte wälzen wir die Alternativen in unseren Köpfen. Wir sind sehr kaputt und noch demotivierter. Das Wetter hat uns ganz schön Kraft geraubt. Abbrechen? Nach Abisko und dort noch Touren machen? Nach Oulu und weiter nach Oulanka den Karhunkierros gehen? Wir beschließen erst einmal eine Nacht darüber zu schlafen. 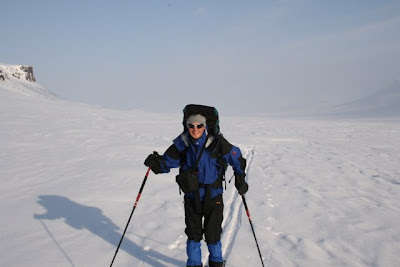 Auf der Hütte sind außer uns noch eine norwegische Gruppe mit 2 Hunden und drei andere Norweger mit Pulkas, die den ganzen Nordkalottleden ab Sjuitelma gemacht haben und nach 4 Wochen nun fast am Ende ihrer Tour angelangt sind: Anneliese, Per und Turril. Auch die drei haben arg mit dem Wetter gekämpft und Bedenken, ob sie morgen nach Altevatn gehen sollen. Es hat noch immer starken Wind aber die Sicht ist besser geworden. Die drei wollen bis Dividal gehen. Als wir ihnen vorschlagen, es zusammen zu probieren, finden die drei das ebenfalls gut und zur Not könnten wir bei Ihnen im Zelt übernachten, falls wir den Pass nicht schaffen und biwakieren müssen. Außerdem haben wir so als Gruppe 2 GPS Geräte, was die Gefahr stark reduziert, bei Ausfall des GPS Gerätes sich hoffnungslos in dieser Weite hieroben zu verirren - sehr gefährlich kann es dann werden. Als Fünfergruppe brechen wir am nächsten Tag recht eilig auf, dachten wir zuerst, das Wetter bliebe schlecht und wir auf der Hütte. Aber es sieht dann doch besser aus, und wir laufen los. Entlang der Sommerroute machen wir einen leichten Bogen nach NNW und steigen wesentlich einfacher als gestern bis zur Passhöhe beim westlich des Ganesbakti auf. Nachdem wir lange aufgestiegen sind und an einem windgeschützten Ort Mittagspause gemacht haben, erreichen wir irgendwann den höchsten Punkt des Tages: das Sámilager Lairevaggegardi. Von hier aus, so dachten wir, ginge es nur noch bergab, aber das war ein Irrtum. Es ist so flach, und das eigentlich bis hin zur Staumauer des Altevatn 400 HM tiefer, dass wir ganz normal weitere 14 Kilometer normal skilaufen müssen, dank Neuschnee kommen wir auch nicht sehr schnell vorwärts. Als es dunkel wird, erreichen wir die Staumauer am Altevatn. Bei scharfem Wind laufen wir ohne Ski über die Staumauer und auf der Straße von Innset die letzten Meter bis zur Hütte. 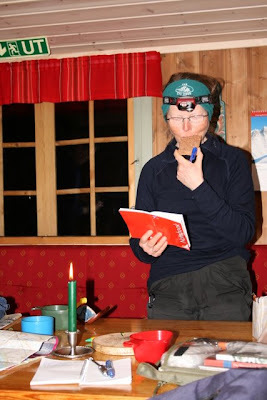 Die Altevatnhütte ist von einer norwegischen Schulklasse aus Bardufoss besetzt, nachdem sie aber ihren abendlichen Vortrag beendet haben, dürfen wir sogar den Rest ihres Rentierragouts verzehren und bekommen Matratzen in die große Küche gelegt - so sind alle zufrieden und wir können eine ruhige Nacht verbringen. 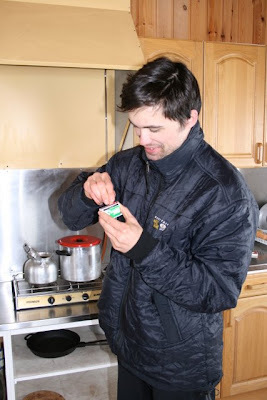 Die Zeit bis der Vortrag zu Ende war haben wir in einer kleinen Hütte neben der Haupthütte bei zwei Norwegern gewartet, die uns netterweise jedem eine Packung leckeren Trockenfisch geschenkt haben - dieser Fisch ist wirklich sehr energiereich, leicht und schmeckt noch dazu sehr lecker. Den Abend verbringen wir mit Per, Turril und Anneliese, wir bekommen von ihnen auch noch so einiges Brot und Süßes ab, da sie am Ende ihrer langen Tour noch zuviel übrig haben. 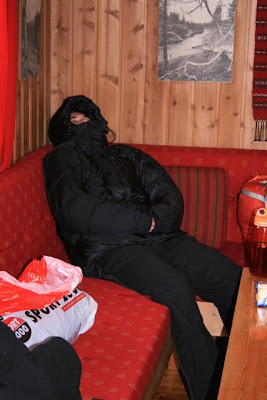 Mit vollen Bäuchen sitzen wir abends in der Altevatnhütte und verbringen später eine ruhige Nacht. Um dem morgendlichen Trubel der Schulklasse zu entgehen, starten wir relativ früh, gegen 8:30 Uhr. Draussen ist wundervolles Wetter aber eiskalter Wind. 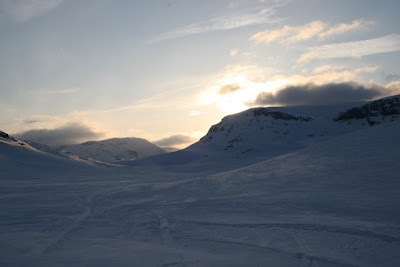 Nachdem unsere drei norwegischen Freunde die Pulkas gepackt haben laufen wir über den nördlichen Ausläufer des Altevatn bei starkem Gegenwind Richtung Osten zur Gaskashütte. Die Altevatnhütte, gelegen über dem Altevatn Stausee. Der Stausee kann im späteren Winter aufgrund der Wasserhöhenschwankung sehr gefährlich sein, also besser einen Local fragen or der Überquerung, im Zweifelsfall besser an frische Schneemobilspuren halten. DerAltevatn-Stausee in seiner ewigen Weite. 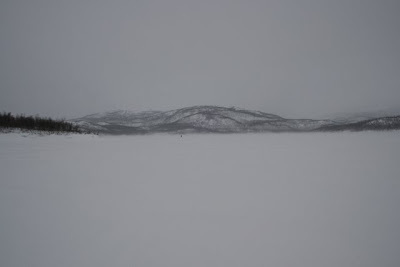 Der See ist etwa 40 km lang von West nach Ost und zieht sich mit einer maximalen Breite von 4 km zwischen zwei Gebirgszügen durch Norwegen. Die Berge zu beiden Seiten des Sees sind sehr weit und hoch, es ist ein wirklich imposanter Eindruck hier über das Eis zu laufen. Ich fühle das Flair, das ich auch in Finnland so liebte: die endlose Weite der Landschaft und den ewigen Winter, der hier oben herrscht. Das beliebteste Fortbewegungsmittel ist hier bis Juni das Schneemobil, Autos können nur bis zum Ort Altevatn verkehren. Skandinavien ist wirklich die letzte Wildnis Noreuropas, hunderte von Quadratkilometern ohne jegliche Straße und in völliger Einsamkeit. Wir überqueren den Altevatn (vatn = See). Es fällt relativ schwer auf dem hartgefrorenen Schnee zu laufen, selbst hier wären Felle von Vorteil, zumindest bei dem Gegenwind, der uns entgegenbläst. Wir erreichen die Gaskashütte (GPS-Daten siehe Überschrift des Tages) recht früh gegen 12 Uhr. Vom Altevatn aus sind wir über eine Landzunge zum Luodnajakka Fluß gelaufen. Der Fluss war völlig gefroren und die Überquerung unproblemtisch. Zudem führen ab dem See mehr oder weniger geradlinige Scooterspuren durch den lichten Birkenwald zur Hütte. Auf der Hütte angekommen sind wir recht müde, vor allem Marko mit seinem schweren Rucksack. 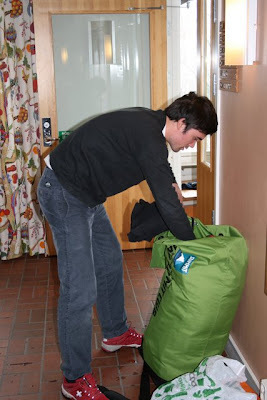 Er hat den Seesack und seine normale Kleidung von der Anreise als zusätzlichen Balast zu unseren 25kg im Rucksack. 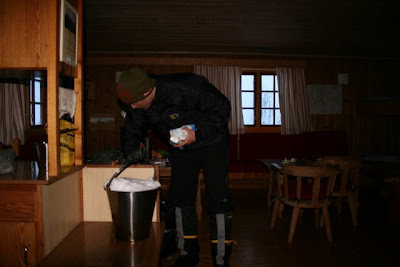 Wir bereiten unsere Skier für den morgigen Aufstieg zur Vuomahütte wieder mit den Seilen vor und verknoten diese mühsam unter dem Ski (die Kunst desch Chnoten chnüpfens lerncht manch inch derch Schweizch beim Klettchern! :-). Am Nachmittag laden uns die drei Norweger zu einem leckeren Kaffee & Kekse Essen ein, wir schlagen uns dankbar den Magen voll und steuern noch ein wenig Schokolade bei, viel haben wir aber nicht zum Hergeben, da wir einen teil des Proviants auf der Lappjordhytta zurückgelassen haben, nachdem wir uns entschieden haben, die Tour um 4 Tage zu kürzen und nur bis Dividal zu gehen (zusammen mit den Norwegern). 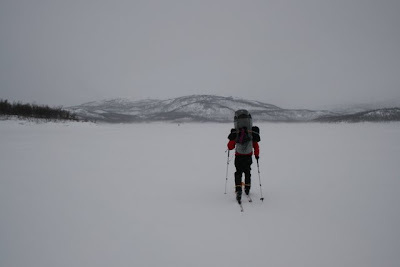 Urspünglich wollten die drei auch bis Kiplisjärvi laufeb und so den ganzen Nordkalotti machen, aber ihnen reicht die Zeit nicht mehr, da sie nächsten Montag bereits wieder arbeiten müssen und es bis Oslo noch eine weite Heimreise ist. Außerdem bringe ich Turril bei, Wegpunkte ins GPS einzugeben und es so während der Tour effektiver zu nutzen. Ich bin erstaunt, wie schnell sie lernt, was ich ihr beibringe und wie effizient sie das neue Wissen am nächsten Tag einsetzt. Entlang einer Schneemobilspur folgen wir zunächst dem Sommerweg hinab in ein kleines Tal westlich der Hütte zur Brücke über den Gaskasvaggi. Kurz steil und dann angenehm flach auf einer Talstufe laufen wir Richtung Nordwesten im Tal des Gaskasvaggi leicht bergan. Nach knapp 4 km erreichen wir den Knick des Tales nach Westen. Hier ist etwas Vorsicht geboten, damit man rechtzeitig nach Westen abzweigt, den Richtung Norden nähert man sich ansonsten dem tiefen Canyon des Gaskasvaggi. Überhaupt sollte man von diesem Canyon, besonders bei schlechter Sicht, Abstand halten und auf der Talstufe oberhalb gehen, etwa 500m entfernt com Talgrund. Danach geht es bergan querend nach Westen bis hinauf auf 900 Meter Höhe. Ich markiere auf der Strecke viele Wegpunkte, falls wir hier nocheinmal entlang gehen wollen. Die Wegpunkte werde ich demnächst hier als gpx-file verlinken. Kurze Pause an dem Punkt, an dem das Tal nach Westen abknickt... Das Wetter ist schön, aber dank starkem Wind beträgt die gefühlte Temperatur um die -30 Grad Celsius. Im Hochtal des Gaskasvaggi angelangt, kurz vor dem Übergang zum Tal des Gelbaluobbalat, der an der Vuomahütte vorbei in den Moskanjavri fließt. Links und rechts des Hochtales ragen imposante Felswände empor, die oben von gewaltigen Schneemengen überwächtet sind. Kurze Rast am höchsten Punkt des Tages, es ist dank des Windes sehr kalt, aber wenigstens war es überwiegend nicht bewölkt. Nur in Teilen des Aufstiegs hatten wir schlechte Sicht, was wegen des Gaskascanyons etwas beunruhigend war. Blick zurück Richtung Hochtal des Gaskasvaggi... 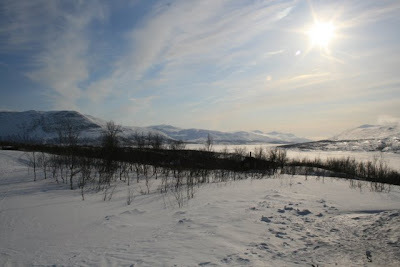 Die Landschaft ist hier schon viel weiter als die Berge kurz nach Abisko und am zweiten Tag unserer Tour. 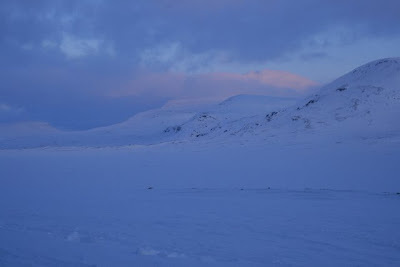 Übrigens haben wir heute beim Aufstieg drei Deutsche getroffen, die aus Kilpisjärvi kamen, sie hatten ebenfalls Rucksäcke und ihr Ziel war Innset. 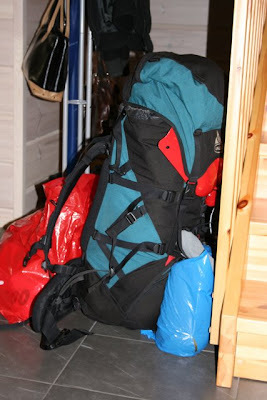 Es waren die einzigsten anderen Wanderer mit Rucksäcken, sonst hatten ausnahmslos alle eine Pulka. Die Vuomahytta besteht aus 3 Hütten: eine 10-Bett-Hütte, eine 8-Bett-Hütte und die Klo/Holzhütte (nicht sichtbar im Bild). Sie liegt im Sommer wie im Winter wundervoll idyllisch am Moskanjavri und eigent sich als Standort zum Fischen und Eisfischen. Es gibt im Holzschuppen sogar einen Eisbohrer. Wer also eine Angelschnur mitführt kann hier Fisch zum Dinner genießen. Wir trinken wieder unseren Nachmittagskaffee, ruhen uns aus und genießen die einsame Lage der Hütte. Übrigens fotographiere ich auf dieser Tour mit einer Canon EOS 400D mit Standardobjektiv und Skylight Filter von Hama. Außerdem habe ich den Batteriegriff BG43 von Canon für die Kamera gekauft und mit AA Lithiumbatterien bestückt, um gegen die Kälte gewappnet zu sein. Die Kamera ist recht unhandlich so, und wie ich nach der Tour erfahren habe, halten 3 Originalakkus auch bei Kälte bis zu einer Woche, d.h. man nehme besser mehrere Akkus als Ersatz und erspare sich den Batteriegriff, ist billiger und die Kamera ist dann auch wesentlich handlicher (!). Über den Sinn eines Skylight- bzw. Polfilters lässt sich diskutieren. Ich würde sogar eher noch einen klaren Objektivvorsatz bevorzugen, nur als Schutz für das Objektiv. 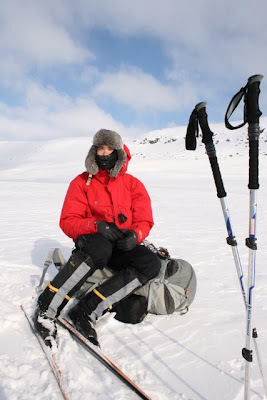 Am Abend beschließen Marko und ich, nicht mit den anderen morgen ins Dividal zu laufen und via Tromso am Freitag heimzureisen. 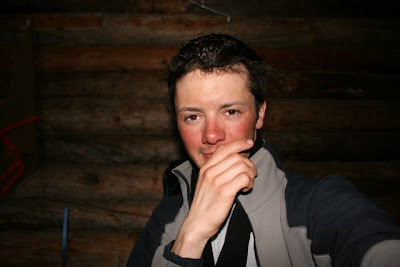 Wir wollen es nun doch noch bis Kilpisjärvi versuchen, alleine schon, weil von dort die Heimreise wesentlich günstiger ist und leichter noch dazu. Irgendwie packt uns nun doch der Ehrgeiz, das Ziel zu erreichen. Turril und Anneliese überlassen uns soviel Vorräte, damit wir die kommenden 4 Tage noch weitergehen können und ermuntern uns zu unserem Vorhaben. Anhand der Karte messe ich für den morgigen Tag Wegpunkte aus der Karte und gebe sie ins GPS Gerät ein. Außerdem beschließen wir sehr früh zu starten, um auf der nächsten angezielten Hütte, der Havgahütte, auf jeden Fall Betten zu bekommen - die Hütte ist nämlich sehr klein, und hat nur 2 Betten. Notfalls können dort auch 4 Personen nächtigen, mehr ist kaum möglich. Achtung: Markiert man die Vuomahytta in der digitalen Túrkart auf einem Garmin GPS, stimmen die Koordinaten um MEHRERE hundert Meter nicht. Wir habe sie dann eher durch Zufall gefunden. Die Einzeichnung in der Karte scheint falsch zu sein. Früh morgens und möglichst leise packen wir unsere ThermARests und Schlafsäcke ein, frühstücken unser allmorgendliches Nuss-Früchte-Müsli mit Eiweiß-Milch-Pulver und laufen dann Richtung Süd-Osten über den Moskanjavri los. Wir kommen zügig vorwärts, trotz etwas Neuschnee laufen wir etwa 3,5 Km pro Stunde und machen kaum Pausen. Recht bald laufen wir entlang des Vuomajohka (johka = Fluss) und überqueren wenig später dessen Flusslauf an einer guten Stelle, wo nicht meterhohe Wechten am Flusshang den Gegenaufstieg erschweren. Beinahe auf der Ideallinie biegen wir nach Süd-Osten ab in das Tal des Gálggovággi. Am Talgrund über leicht hügeliges Gelände erreichen wir schnell den See im Tal, auf etwa 700 Meter Höhe. Der Wind hat mittlerweile zugenommen, dafür hat er nun die Wolken vertrieben und das Wetter ist wirklich sehr schön und sonnig. Blick zurück im Gálggovárri Richtung Nordwesten. Heute macht das Gehen dank schönen etters und guter Schneeverhältnisse wirklich großen Spaß und wir haben richtig Energie und Lust bekommen, Kilpisjörvi doch noch zu erreichen. Wir planen die noch ausstehenden 120 Kilometer in 5 Tagen zu bewältigen, eine weite Strecke mit langen Tagesetappen. Das Gelände wird aber flacher und es gibt eigentlich nur noch zwei Übergänge mit jeweils 800 Meter Meereshöhe, ansonsten verläuft die Strecke im Gegensatz zu bisher überwiegend durch weite Fjellandschaft und sehr flach. Kleine Rast unterwegs, eine Tasse Tee und ein Powerbar (meist steinhart gefroren, ich haue mir desöfteren beim Abbrechen des Bars mit den Zähnen die Hand gegen die Nase... ausversehen und wirklich!). Blick Richtung Dividalplateau (der Birkenwaldstreifen hinter der weiten Ebene im Vordergrund). 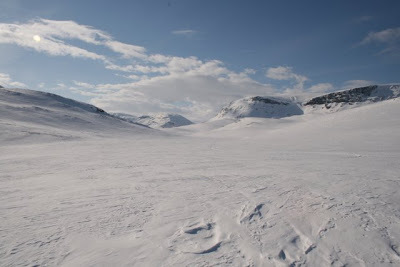 Der Dividal ist ein Nationalpark der sich ab der Vuomahytta bis hin zur schwedischen Grenze über ein riesiges Gebiet des Fjells erstreckt. Die Havgahytta (Havgahütte) liegt gemütlich im Birkenwald des Dividal. Der Innenraum hat nur zwei Betten, einen Ofen, einen Schrank, eine kleine Bank und einen kleinen Tisch - ein Gaskocher gibt es nicht, auch kein Geschirr... Aber das ist ja eher Luxus, was die norwegischen Hütten da sonst so bieten. Wir genießen den Nachmittag draussen vor der Hütte in der Sonne, abends bereiten wir in der höllisch heiß gewordenen Hütte (der Ofen funktioniert mehr als gut... zu gut :) unsere Pasta zu. Leider ist die Pumpe des Primus Omnifuel Kochers beschädigt worden, im Rucksack - mal sehen, was nach der Tour hier an Ersatzteilbeschaffung möglich ist. Zum Glück lässt sich die Brennstoffflasche aber noch unter Druck setzen und wir können den Kocher nutzen. Ohne hätte es wohl schwer werden können, Trinkwasser zu kochen und erst recht Pasta zuzubereiten. Pasta schlürfen par excellence... Nach dem Essen gehen wir früh ins Bett, um für den morgigen Tag bis zur Daertahytta (Daertahütte) fit zu sein. In der Nacht bekomme ich Fieber und schwitze wie verrückt, mein Schlafanzug ist klitschnass, aber am morgen geht es wieder. Ich nehme übrigens noch immer dreimal am Tag Codein, um meine Erkältung in Schach zu halten. zuhause muss ich mich unbedingt auskurieren. Aber ich habe des Gefühl, dass es trotz der Tour langsam bergauf geht. Ab der Daertahytta benutzten wir die Fjällkarta BD1 der Schweden. Zuvor haben wir die norwegische Turkart Bardu benutzt. Beide sind bei der Geobuchhandlung Kiel erhältlich. Nach einer dank Erkältung nur mittelmäßigen Nacht wache ich am nächsten Morgen voller Spannung auf den weiteren Weg auf, Marko geht es wohl eben so. heute haben wir wirklich eine lange Etappe vor uns. Die Wetter- und Schneebedingungen werden heute über unseren Erfolg entscheiden, wir fühlen uns auf jeden Fall fit genug, es nach Kräften zu probieren. Von der Hütte aus laufen wir nach Norden zum Rentierzaun. Diesem folgen wir nur 200 Meter, um dann an einer niedrigen Stelle darüberzusteigen. In der Turkart ist die Hütte fälschlicherweise nördlich des Rentierzaunes eingetragen, sie liegt aber etwa 100 m südlich davon. Zunächst durch hügeliges Terrain und Birkenwald steigen wir bis zur Baumgrenze auf 700 Meter Höhe und exakt westlich des Gipfels des Julosvárri auf. 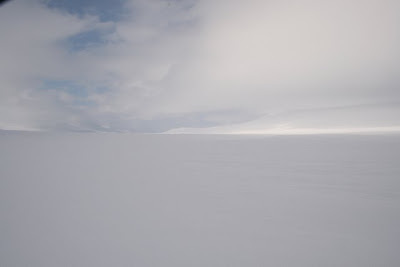 Von dort aus folgen wir der oben fotographierten Snowscooterspur sanft bergan durch welliges Gelände in Richtung Passhöhe des Jierttáláhku auf 800 Metern Höhe. das Wetter ist heute exzellent, ab und an bläst nur der Wind etwas stärker und trägt Schneekörner durch die Luft. Rückblick entlang unserer Spuren in Richtung Dividal aus dem Julosvággi-Tal. Die Passhöhe am Ende des Julosvággi-Tales. Man hält sich oben günstigerweise eher mittig bis links im Tal um erstens Weg zu sparen und zweitens die Flusscanyons im Bereich Julosjavri zu umgehen. Durchquerung scheint eher ungünstig und mühsam, daher der beschriebenen Variante folgen. In der weiten Ebene des Jierttavuopmi, am Jerta, einem 1428 Meter hohen Berg, hängt eine gewaltige Schneefahne vom Wind - beeindruckend! Auf dem Weiterweg durch die Ebene haben wir für gute 10 km starken Rückenwind, der uns vorantreibt und schnell erreichen wir deshalb die Daertahütte. Es empfiehlt sich, nach dem unna Nannas über den kleinen Sattel südlich des Jalgohas zu laufen, den Hügel zu umgehen lohnt nach eigener Erfahrung gar nicht. Die Daertahütte ist sehr gemütlich und schön und bietet den selben, nahezu unwirklichen Komfort wie auch schon die anderen DNT Hütten: viel Feuerholz, Gaskocher, alles Geschirr, Kerzen, Notvorräte... Wir machen aber nur eine Stunde Mittagspause, trocknen unsere Füße ein wenig und wollen dann weiter. 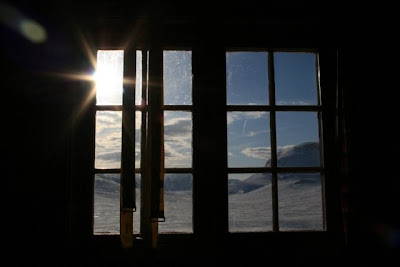 Wir möchten heute die Storrostahütte erreichen, um uns den zweiten Tag bis Kilpisjärvi etwas zu verkürzen. Blick zurück auf die einsam gelegenen Daertahütten (wieder zwei Hütten mit insgesamt 20 Betten). kurze Pause, der Rucksack ist sooo schwer... und 45 km sind einfach sehr weit...! Wir erreichen die ganz neue Storrostahütte ziemlich erschöpft gegen 20 Uhr. Die Hütte ist wunderschön, ganz neu gebaut. Nur der Ofen will anfangs nicht so richtig ziehen und löst ersteinmal Rauchalarm aus... Der durchdringend piepsende Rauchmelder ist aber durch Entnahme der Batterien schnell entschärft. Heute gibt es pro Nase gleich zwei der Treckingnahrungen, die wir von Anneliese und Turril netterweise geschenkt bekommen haben - diese Fertignahrungstüten von "real turmat" sind wirklich sehr praktisch, man gießt kochendes Wasser hinein, verschließt sie mit dem Schnellverschluss für 5-7 Minuten und kann danach direkt anfangen aus der Tüte zu essen. Die Packungen wiegen 140 Gramm und ergeben zwischen 500 und 650 Kalorien, je nach Gericht. So kommen wir heute Abend auf 1300 Kalorien pro Nase, soviel esse ich an manchen Tagen zuhause den ganzen Tag über. Es ist schon verrückt, was für einen Energieumsatz der Körper bei solchen extremen Touren aufgrund der körperlichen Anstrengung und der Kälte hat. Man kann von mindestens 1000 Kalorien / 10 km Weg ausgehen, mindestens aber 3500 Kcal pro Tag, egal wie weit man läuft. An Tagen wie heute kämen wir also locker auf vier bis sechs tausend Kcal pro Person. Praktisch an real turmat ist zudem, dass es kein dreckiges Geschirr zum Abwaschen gibt, nur die Beutel in den Ofen und nachher die Asche der Beutel in die Mülltüte schaufeln, fertig. Beim Zelten in dieser Lage und um diese Jahreszeit fände ich diese Mahlzeiten das einzig Wahre, denn da fällt das Abwaschen ja noch schwerer. Ab der Daertahytta benutzten wir die Fjällkarta BD1 der Schweden. Zuvor haben wir die norwegische Turkart Bardu benutzt. Beide sind bei der Geobuchhandlung Kiel erhältlich. Dier hier angebenen GPS-Daten sind nicht schlecht-wetter tauglich, da handgemessen aus den Karten. Im Zweifelsfall also lieber einen Local fragen, ob er die Daten hat. Noch etwas kaputt vom gestrigen Tage starten wir wieder um 7 Uhr morgens von der Hütte. Wir folgen einer Hundeschlittenspur nach Norden, dann einer Schneemobilspur, da sich die Hundeschlittenspuren nie besonders gut gehen. Die Hunde wühlen den Schnee einfach zu sehr auf und außerdem sackt man mit den Skiern immer in die tiefen Rinnen des Schlittens. Zuerst laufen recht lange Richtung Rostahytta entlang der Scooterspur und merken schließlich, dass wir viel zu wiet nach Westen abgewichen sind von unserer geplanten Route. Hätten wir nur früher das GPS Gerät genutzt. Wir machen einen Knick nach Osten und erreichen bald darauf den Riehttejávri. 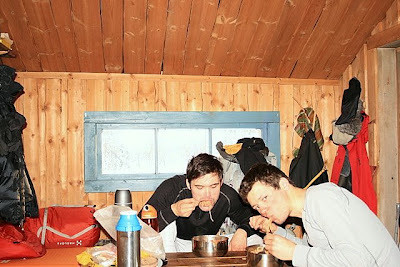 Mitten auf dem See haben einige Norweger mit Hundeschlitten (die Spuren bei der Storrostahütte waren vermutlich von dieser Gruppe) ihr Zeltcamp aufgeschlagen. Mehrere große Tunnelzelte stehen verankert mit großen orangen Schneeheringen und Skiern im Schnee. Blick über den Riehttejávri Richtung Osten. Die Landschaft ist jetzt sehr weit und wir orientieren uns an den wenigen sichtbaren Bergen. Würden wir genauer mit Karte und Kompass arbeiten, wäre die Orinetierung selbst ohne GPS ganz gut machbar. Da wir es aber eilig haben und noch soviel Weg vor uns liegt, greifen lieber auf unser exzellent funktionierendes Garmin E-Trex H mit den gestern wieder eingetippten Wegpunkten zurück. Nach 20 km seit Tagesbeginn erreichen wir durch 4km Tiefschnee auf den letzten Kilometern und nach einer recht rasanten Abfahrt mit steileren Passagen die Pältsastugan. Die Hütte liegt malerisch auf einem Rücken vor einem Bergmassiv, das wir auf unserem Weg heute noch überqueren müssen. Im Hintergrund der Vávrrotoaivi, ein 900 Meter hohes Bergmassiv, das wir nachher überqueren müssen. Glücklicherweise ist der weitere Weg aber mit Holzkreuzen mehr als gut markiert und von Scootern gespurt - es sollte also kein Problem mehr darstellen, die finnische Autiotupa (offene Übernachtungshütte) Koukkimajärvi zu erreichen. Nach der Überquerung des Bergmassivs in Richtung Finnland bei heftigem Wind und schlechten Sichtverhältnissen - unsere Kräfte werden nochmal gefordert, aber emotional sind wir schon drüben, da der Weg markiert und gespurt ist... - erreichen wir das Dreiländereck Finnland, Schweden und Norwegen (=Treriksröset). Wir machen viele Fotos und gratulieren uns zur bestandenen Tour. 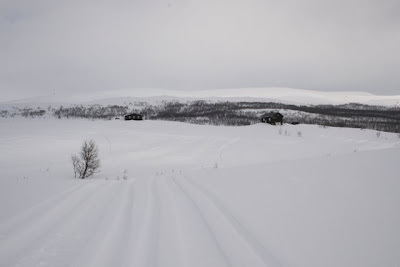 Nun trennen uns nur noch einige Hundert Meter zur Koukkimajärvi Hütte in Finnland und die morgige kurze Etappe über den Kilpisjärvi vom Ziel - die Vorfreude auf die Zivilisation und die Freude über unseren nun doch noch eingetretenen Erfolg, dieser anfangs unter wirklich schlechten Vorzeichen begonnenen Tour steigt! Abends in der finnischen Hütte begutachten wir unsere Füße - eingetapet sein 9 Tagen haben wir beide kaum ernsthafte Blasen bekommen. Ich muss vor der nächsten Tour abe rumbedingt daran denken, mir die Beine und Füße im Schuhbereich zu rasieren, denn die Haare wirken auf Dauer wie Schmirgelpapier zwischen dem Socken und der Haut im nassen Schuh (nass vom schwitzen im Schuh). Wir freuen uns nun über den Erfolg, das kann nichtmal die etwas gammilge Hütte verderben - die Hütte liegt scheinbar in der Zone der Tagesausflügler und ist sehr vermüllt, zum kurz dort übernachten reicht es aber. 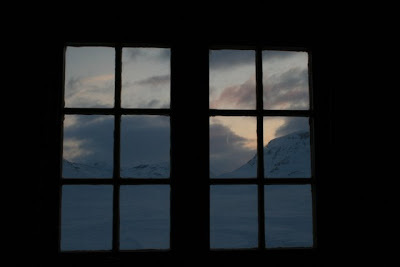 Überleg Überleg... was esse ich morgen im Hotelli Kilpisjärvi als erstes? Pulla? 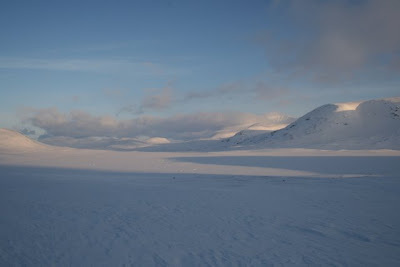 Entlang der markierten Langlaufroute brechen wir am Morgen bereits um 6 Uhr auf und laufen zügig über den Kilpisjärvi See. Da uns das Frühstück fehlt, geht das ganz schön in die Kraft. Aber nach guten 2 Stunden erreichen wir auf der leicht verschneiten Loipe, die die ganze Zeit mit blauen Plastikstangen markiert ist, das Ufer. Über eine Art Dauercampingplatz suchen wir den Weg zur Straße, sind erschrocken, dass es zum Hotel noch 5 km sein sollen. Aber da entdecken wir das Wanderzentrum nur wenige Meter weiter an der Straße und kehren dort ein, auf dem Parkplatz steht bereits der Bus, den wir nachher nehmen möchten. Nun haben wir unser Ziel wirklich und unbeschadet erreicht - eine große Freunde und ein großer Erfolg. Was haben wir gelernt? Pulka statt Rucksack, bei Schlechtwetter besser einen Tag auf der Hütte verbringen als viel Kraft bei sinnlosen Versuchen zu vergeuden, Treckingnahrung ist auch nicht zu verachten aber eben teurer als Pasta, Fotoakkus + Ladegerät statt Batteriegriff (wenn einmal pro Woche aufladbar), jeder ein Handy dabei haben, Felle sind sinnvoll, am besten ein langes und den ganzen Ski bedeckendes und ein kurzes für die Steigzone des Skis (so wie bei Asnes zb im Angebot). Im Wanderzentrum schlagen wir uns am Frühstücksbuffet für 8 € den Magen voll, so viel wie wir essen, sind acht Euro geradezu ein Schnäppchen, weniger hätten wir für diese Mengen nichtmal im Supermarkt gezahlt hehe ;). Nach dem Frühstück geht es um 11 Uhr mit dem Bus via Karesuvando, Munio, Hotelli Jeris, Levi und Kittilä nach Rovaniemi. Dort kommen wir nach geruhsamer Busfahrt um 17:30 an. Um 18:00 fahren wir dann mit dem Zug weiter nach Oulu, dort kommen wir um 21 Uhr an. Marko wird von seiner finnischen Tandempartnerin Heidi abgeholt, mich holt mein Kummivater Rainer ab. Zuhause wird ersteinmal geduscht - sehr sehr angenehm!!! Außerdem hat Rainer mir die Sauna vorgeheizt und ich genieße diesen außerordentlichen Luxus in vollen Zügen. Danach bekomme ich noch leckeren Nudelauflauf und Kuchen zu essen, um dann wie ein Stein zu schlafen. Danke fürs Lesen und für euch Alles Gute! Bei Fragen oder Interesse melde man sich einfach bei uns oder schreibe hier einen Kommentar! PS. Dieser Artikel ist teil der Blogparade vom TiggR Blog.